The next best thing to Preserves and Jam(s) is Stewed fruit. At least for me. I love the sauce/syrup with nice chunks of fruit. But more than that I love the fact that they are utterly simple and quick to prepare. Takes like 15-20 minutes MAX. I make these often especially as a side to our breakfasts. Served warm over pancakes, waffles or toast, these make for better alternative than regular maple syrup, honey or butter. I mean when you are looking at 3-4 servings of fruit a day and if you are not one to pick up fruits as and when you cross the table( like me. Sigh! ), then better to sneak it, in as many ways as possible! 1. 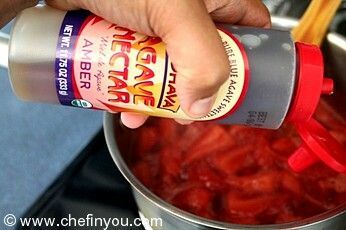 If you do not have Agave Nectar, you can use regular sugar instead. Any other sweetener (honey, brown sugar, sucanant, Splenda etc) can also be used. 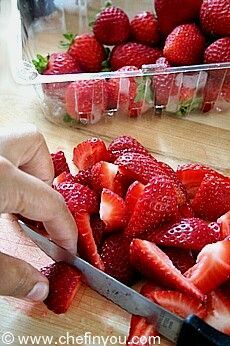 The amount will vary depending the sweetness/tartness of the berries and your taste preference. My batch of berries were mildly sweet and since we do not like to eat too much sweet during mornings, I used about 1 tbsp ( may be a little more) of Agave. Agave is much sweeter than sugar or honey so a little goes a long way. 2. You can also add additional flavoring like lemon zest and juice to this. 2. and then sliced each of the halves again into two. It will depend on the size of the berries too. 3. Place them in a colander and rinse them gently under cold water. You can wash them first and then chop. No hard or fast rules here. 4. Drain the water well and place the berries in a saucepan. 5. Cook them in medium heat. Give it a stir now and then. 6. Around 5 minutes you will find the berries releasing their juices. 7. In another 10 minutes (around 15 minute mark) it will look like this. 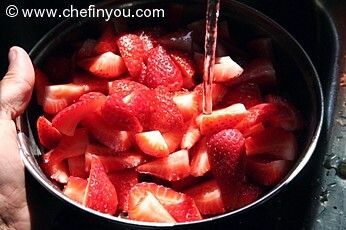 I want nice flow'y sauce with sizable chunks of the fruit hence do not cook further. 8. At this point I add the sweetener. I cook it for another 5 minutes and cool the sauce. Its now ready. We love the tart mildly sweet berries with almost all our breakfast goodies (exception of Indian B/Fs). You can warm them up in microwave for few seconds. I have never made a huge batch since this is ridiculously simple. I usually make it on a week to week basis hence I am not sure how long it really keeps in the fridge. I store them in an air tight container. 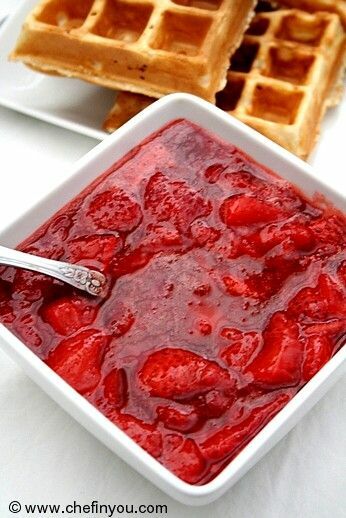 Yummy warm stewed strawberries with waffles anyone? Thanks soooo much DK for this recipe!! It looks gorgeous on pancakes and tastes really good. 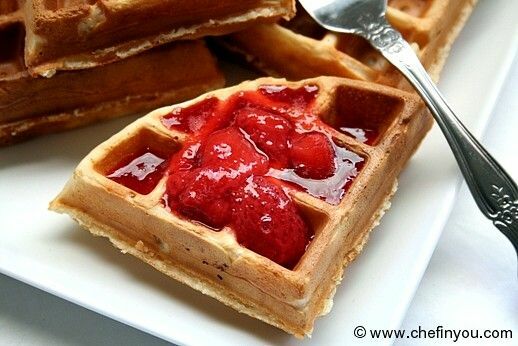 Makes a yummy and healthy dessert with vanilla yoghurt. Both my husband and I dont like anything too sweet so the tartiness of the strawberries is perfect for us. And since its so simple to make Im totally addicted! Only change I made is I used 1 tbsp white sugar instead of other sweetners. Have you ever canned this recipe? Either pressure cooker or water bath . This is the first time I've made a syrup substitute, and the first time I've ever used agave nectar. I was looking for more ways to reduce the sugar in my meals. This is a lovely and easy recipe! Your pictures were invaluable! 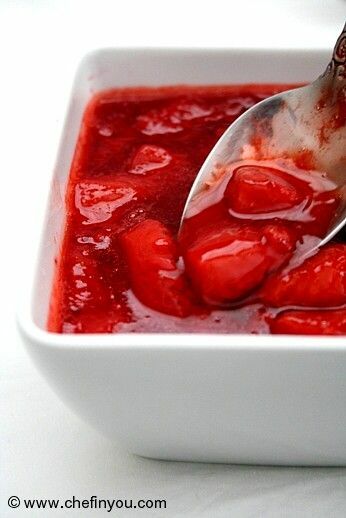 I was thinking of making a strawberry coulis to put over over-night french toast for a family brunch, when I saw this recipe and I think it will be much better. I love how simple this recipe is. I am thinking of making it for our family breakfast gathering this weekend. Thanks for the idea as many of my family are having to watch what they eat. 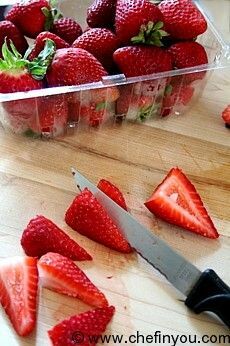 you don't need to put any sugar in at all as strawberries are sweet enough. If you want more/different flavour you can add cinnamon or ginger. Also to sweeten naturally you can add a little banana. No need for any sugar as fruits contain fructose. I am a type 2 diabetic and am in need of sweet things that aren't full of Unnatural sugars, Agave, Truvia , but never Splenda it tastes bad. Hi! I can't seem to find the nutritional information anywhere. Could you tell me what the calories and other nutritional values are? Thank you so much! Is this possible with other berries?? I make this to pour over the top of a sweet cheesecake I baked. It was the star of the dessert cause it was tart and not too sweet. I used just a hint of sugar (maybe a Tablespoon) that wsy they tasted natural wasn't too much sweetness. Everyone was bragging on it and wants more!! 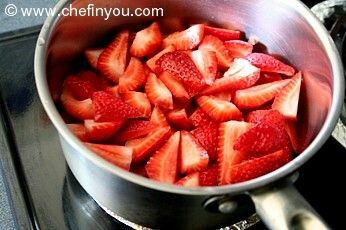 fantastic - I had no idea .. garden fresh strawberries and 1/2 tsp of honey crystals. posted on my facebook page :-) THANK YOU for sharing! By the way,...they are fabulous canned! I canned them in little half pint jars, adding 2 tablespoons of fresh lemon juice as a preservative. They taste wonderful! :wink: Thanks for sharing this recipe, I always wanted to learn how to make this one. I will make it soon! It looks like broken hearts - sweet! Sorry for the duplicate, I forgot to click the notify button. 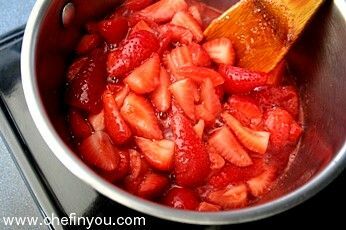 I have a quick question: how long will the stewed strawberries last? Thanks for the lovely recipe. 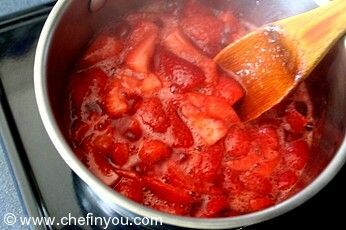 I have a quick question: how long will the stewed strawberries last? I made this recipe this morning and it was REALLY good. We'll be making it again. :D There wasn't as much as what shows in your photos though. I suspect I cooked it too long or at too high of heat. It covered three waffles and was gone. YUM! 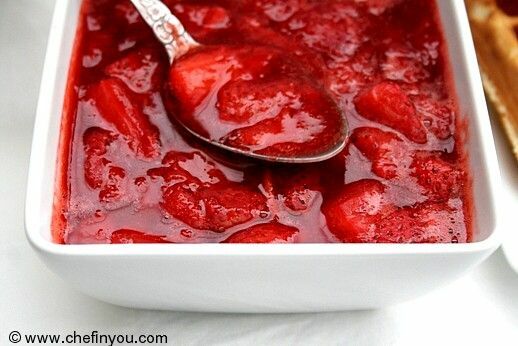 I have always made this by mixing strawberries and sugar in a large glass bowl and cooking in microwave oven, it turns out good. Chill it and spoon on top of diced ripe mangoes.....heavenly. 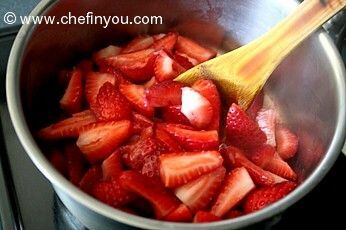 Woww i can have this delicious stewed strawberries with anything..
Love the color .. perfect with pancakes.